With the sun disappearing, I’ve been switching up my skincare routine for products that really pack in the moisture. Whilst exfoliating products can be drying and require the use of a SPF, I find they’re the only way to keep my skin looking fresh and glowy yearlong – plus, they seriously help the absorption of oils and serums. I’ve been trying a few new products lately so thought I’d share my favourites that I keep on rotation. This is one of my latest discoveries and it’s blown me away! It feels incredibly gentle and doesn’t sting any broken skin, but by morning, your complexion is noticeably clearer and glowing. I’ve found this is my go to if skin is slightly blemished as it really helps break down any uneven skin and reduce pigmentation. The bonus of this is that you can use it on a daily basis which is fairly rare for peels containing Glycolic acid! I definitely think that this is the AHA exfoliator to try if you’re new to the whole AHA game. Not only is this under the £10 mark, but it really does it all! Not only do the AHA’s help to exfoliate at a surface level, the BHAs mean that it penetrates down to pore level and helps remove dirt and prevent clogged pores. Not going to lie, but this is somewhat terrifying to apply as it looks blood red, but it is worth the 20 minutes of avoiding people! If you do have any breakouts, I’d avoid applying this to those areas as it doesn’t help improve anything (and could exacerbate them!). Love. Love. Love! Perhaps the gentlest exfoliating peel I’ve tried, this is definitely one to try for more sensitive skin. This peel uses the natural fruit acids of papaya and pineapple to buff away dead skin cells, leaving skin soft and fresh. It has a cream like formula which means it feels soothing on the skin, so would be an ideal exfoliator if you suffer from general redness! I leave this on the skin for between 10 – 20 minutes and then wash off. 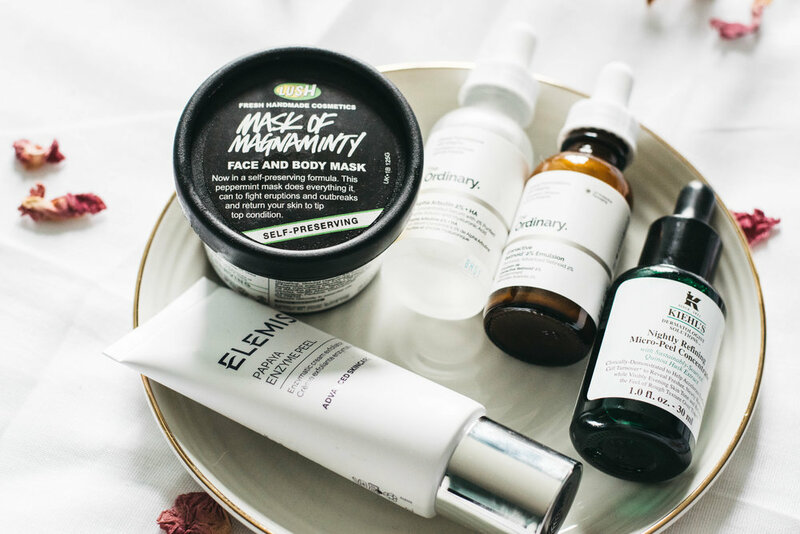 I’ve recently started my role as a Beauty Editor for a website so I’ve been trying a lot more skincare, and as a result have had a few more spots than usual. I spotted this, which claims to improve spots and pigmentation/scarring so I was sold! I’ve been using this for just over 2 weeks and it’s made a noticeable difference. It feels quite gentle and doesn’t skin, and the added bonus of the Hyaluronic acid means that skin is left plump! I’m certain that this is one of those acids that is under the radar at the moment but if you have problem skin this is one for you! Compared to Salicylic acid which only improves skin whilst being used, Alpha Arbutin improves skin in the long run, preventing breakouts from a deeper level as opposed to a temporary fix! As much as I love a chemical exfoliator, there is nothing I love more than the occasional physical scrub. Whilst I avoid using daily scrubs, I love the Lush mask of Magnaminty for weeks where I may have been wearing slightly more makeup than usual! The mask contains refreshing mint, anti-bacterial honey and soothing kaolin, as well as the exfoliating evening primrose seeds and aduki beans. I apply this all over and let it sit for as long as I have (often 30 minutes) before removing using my fingers. I gently remove by using a circular motion and find this is the best way to exfoliate whilst removing! Once I’ve given my skin an effective scrub, I use a flannel to remove the excess. It’s a good un’ -just don’t use this more than once a week or on top of a daily exfoliator as it could damage surface level capillaries in the skin. I genuinely feel like I’ve really locked down my skin and a key part of that is having a regular exfoliator incorporated into my routine. Please note that if you use a chemical exfoliator, you should always wear SPF the following morning!